Illness has struck the Postcard household this week so therefore there won’t be a Stroll around Gibraltar until next week. I have been housebound with two small patients who’ve been rather under the weather. 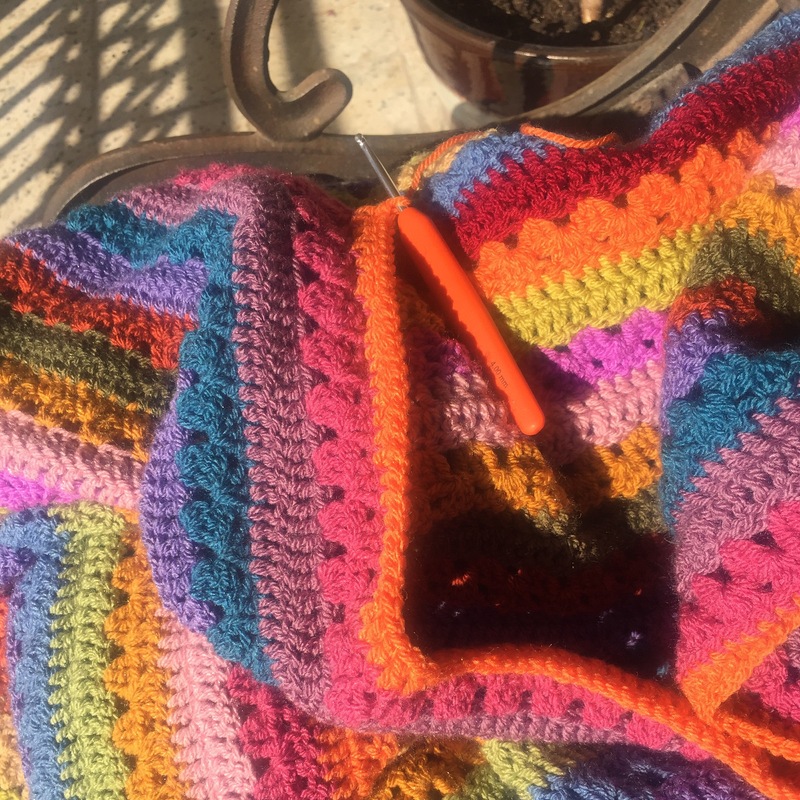 I have gone a bit stir crazy at times but it’s not been all bad, I managed a bit of crochet in the sunshine between Calpol administration and cuddles. At the weekend, I read an intriguing review of the book Castles in the Air by Alison Ripley Cubitt on the Rough Seas in the Med blog. As I was stuck on the sofa trapped under fever-stricken children I decided to give it a go and downloaded it to my device. It was an excellent read, I managed to finish it in 24 hours which those in my book group will know is pretty rare for me these days. If you’re interested in reading an account of expat family life (far more glamorous and exciting than mine I hasten to add) I would highly recommend it. I escaped the apartment this evening for a short walk (my sanity depended on it), I walked along to Rosia Bay where Nelson’s ship HMS Victory was brought after the Battle of Trafalgar. There were no big sailing ships there tonight but a few big tankers were bunkering in the bay (the floodlights belong to one of them). 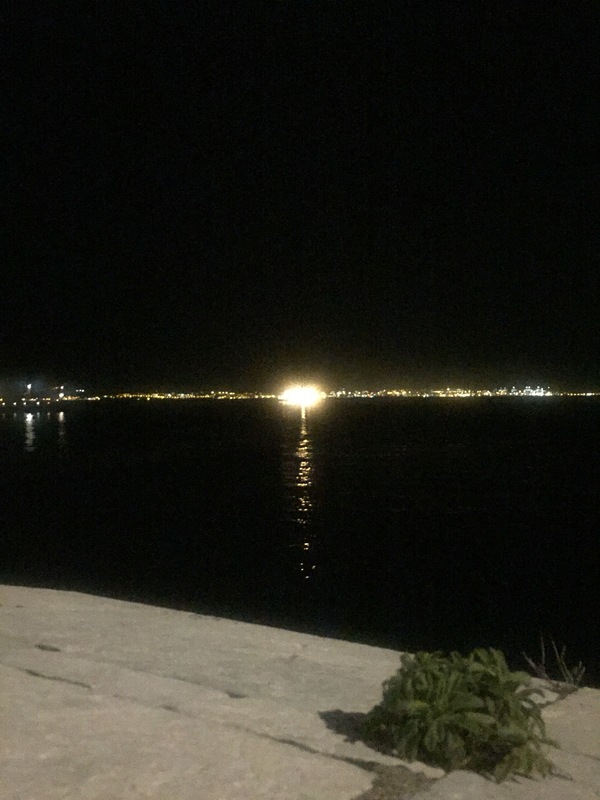 The lights in the distance are the Spanish port of Algeciras. 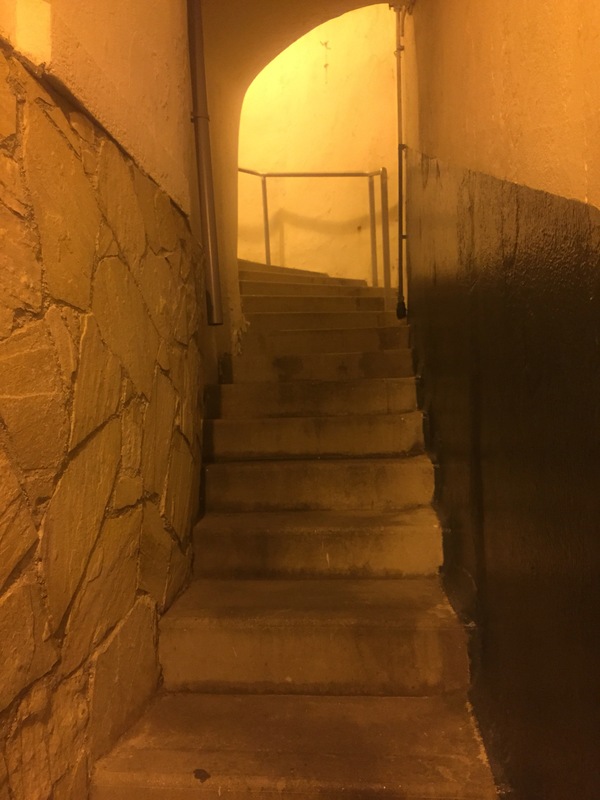 Oh, and I found some more steps…. Sorry to hear about the Postcard Sick Syndrome, but secretly pleased no Med Step stories to make unfit me feel guilty. I like Rosia. Goodness knows what it will end up like if the proposed development comes off. Thanks, I’m feeling very guilty. There’s a lot of biscuit eating and not much exercise going on round here at the moment! Oh no…get well soon Postcards! Your crochet is gorgeous, so summery 🙂 I hope the little ones are well again soon. sorry to hear the little ones have been unwell – wishing them better very quickly.